Nobody could ever accuse a government led by Enda Kenny of under-selling its achievements. A self-congratulatory tone (sometimes justified, sometimes less so) has been ever-present since Fine Gael and Labour took up the challenge of "saving the country", as they liked to portray it. To be fair, history will judge that they did a decent job in that endeavour. Is Ireland a better place than it was in 2011? Most definitely, it is. And for that, Mr Kenny and his two governments deserve some of the credit. But the egotistical narrative that "only we could have delivered" has, to this observer at least, always been the least appealing feature of their time in office. They seemed to believe their own (relentless) publicity a little too much for comfort. And so it was last weekend. 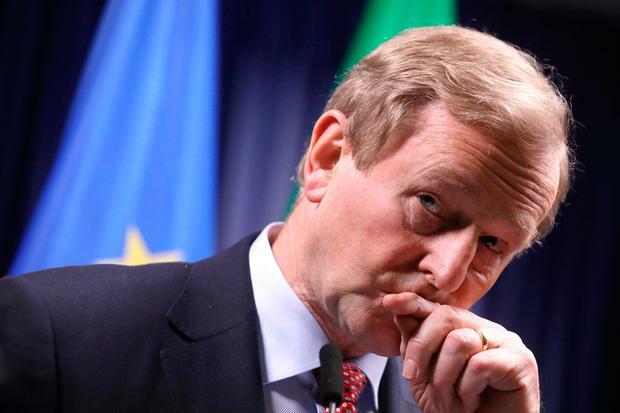 The Taoiseach's punching of the air as he came out to face the media in Brussels on Saturday was classic Enda. The action screamed: "Look at me, I've done it". But what that "it" actually means is far harder to determine. Most of the positive headlines centred on the Taoiseach's "victory" in securing a commitment that if a united Ireland came about, it would automatically be granted EU membership. But that precedent was already there from the reunification of Germany a quarter of a century ago. It was hardly breaking new ground. And, while a united Ireland looks more possible now than a year ago, there's no chance of a Border poll endorsing that prospect any time soon. Opinion polls continue to suggest little appetite for a united Ireland. And, as Bertie Ahern warned on Sunday, forcing that issue prematurely is a "dangerous game". Mr Kenny himself acknowledged that the conditions for a Border poll do not exist. If that is the case, why worry about it now, given the existence of the Germany precedent? To herald the agreement on automatic EU entry for a united Ireland as "hugely important" hardly makes life easier for Arlene Foster. Her positive comments on avoiding a hard Border and the "unique" solutions required for this island show a belated, but hugely welcome, sense of reality and pragmatism. That should be supported and a little more sensitivity from our Government in that respect wouldn't go amiss. It would be churlish, though, to dismiss the achievements of the Government and our diplomatic service in securing recognition of Ireland's position relative to the UK in advance of the Brexit talks beginning. We do diplomacy well in this country, and this occasion has been no exception. Plaudits to all concerned. How much of it was specifically down to Mr Kenny's famed contacts in Europe is simply impossible to know. The issues concerned - the common travel area with Britain, the land border and, especially, the Belfast Agreement - could hardly have been ignored by our EU partners. As one of the longest-serving EU members, we do have some clout in Brussels. It's impossible to know from the outside just how close the Taoiseach really is to Angela Merkel, somebody whom he sees a few times a year - and if the cool and calculating German chancellor would be particularly influenced by such relationships. Perhaps Mr Kenny's contact book was indeed a key component. Certainly, he would have taken all the stick if Ireland's unique position wasn't recognised in the negotiating principles, so it's probably fair enough for him to take the accolades when it was. But either way, a little like Neville Chamberlain coming home from Munich in 1938 declaring "peace for our time", it would be wise not to get too excited just yet about what has been delivered. We are still in the phoney war stage. The battle hasn't begun. And if the leaks of Theresa May's dinner with Jean-Claude Juncker, the EC president, are anything to go by, things are going to get very messy. And potentially ugly, as well. If that happens, and the you-know-what hits the fan, it would be naive to imagine that the emphasis given to Ireland's "unique" position in the negotiating principles will matter a jot. We will be collateral damage. There are two ways of assessing the British prime minister's reported attitude at the dinner with Mr Juncker. The more positive one is that her only priority at the moment is to secure a massive majority in the general election. And reports of her playing hardball with Jean-Claude Foreigner can only help her chances of doing so. Once that majority is secured, the serious business of negotiations can then begin. But the more worrying assessment is that Mrs May is out of her depth and that Britain is indeed in a "parallel reality" - its leaders making it up as they go along with a guileless viewpoint that they'll be fine regardless. The hope is that it's the former. We need Britain to do a good deal with the EU. One must assume there are some very clever people advising Mrs May and her government. But still it's at best 50-50 that the negotiations will go in any way smoothly. What is surely beyond doubt is that the negotiations are going to take a long time - notwithstanding Mrs May's belief that the controversy over the future rights of EU citizens living in the UK can be settled by next month. Given that, it's surely desirable a new taoiseach is in situ sooner, rather than later. Mr Kenny is now effectively a caretaker Taoiseach and has been for some time. Politically speaking, he's living from month to month. Our European partners know he's on the way out and, old friendships or not, that inevitably means he just cannot carry the same clout. That's no way to enter into the most important talks this country will be involved in since the Anglo-Irish Treaty of 1921. As everyone knows, we didn't field our strongest team back then, and look how that turned out. Forget the spin and the PR coming from Mr Kenny's camp - it's time the mantle and the mandate, to secure the best possible deal for Ireland in near-impossible circumstances, is passed to the next generation. Without delay. Shane Coleman presents Newstalk Breakfast, weekdays from 7am.